Animation series and films produced in Japan belong to a genre known as anime. This genre gathers a great amount of fans from all over the world. Being a major success in the United States, as well as Asia, Europe and Latin America. 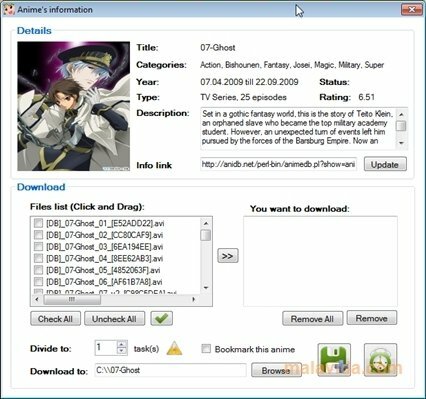 We have an essential utility for all anime fans: Anime Downloader. 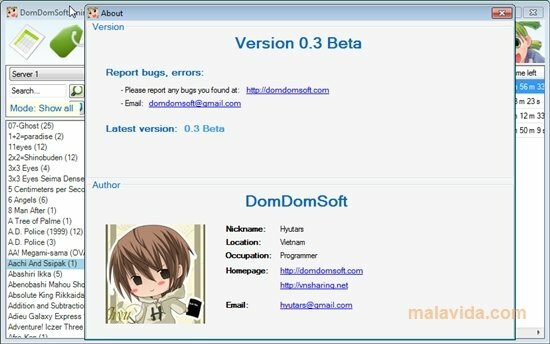 It's a download manager for animated series, OVAs and animated films from Japan. Its main feature is that it provides direct access to a vast list of anime blockbusters to be able to download them directly from any of the servers that the application downloads from, without having to performs searches over Internet. 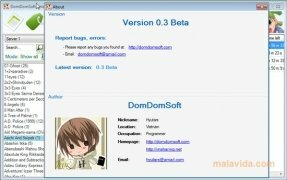 - Practical multimedia contents manager for the anime genre. - Detailed reports of each title, as well as available parts. - Options to place in the queue, start, pause or resume downloads. - High download speed, by obtaining various parts of the file segmented. - Integrated search engine, that allows searches by name or by category. - Possibility to create a favorites list. Thanks to Anime Downloader, you'll be able to find and download all your favorite Japanese anime series. The free trial version only allows five downloads every 24 hours.